When I travelled to India, it was only the second time I’d ever been there. The first was when I was just 4 years old so the few memories that I do have are very vague. This time round, we spent the first couple of weeks sightseeing in Delhi, Jaipur, Agra and Varanasi. I loved visiting the different places and learning a little about India’s history (I’ll admit I knew very little before I went). I had a brilliant time (as you can probably tell from my previous posts!) 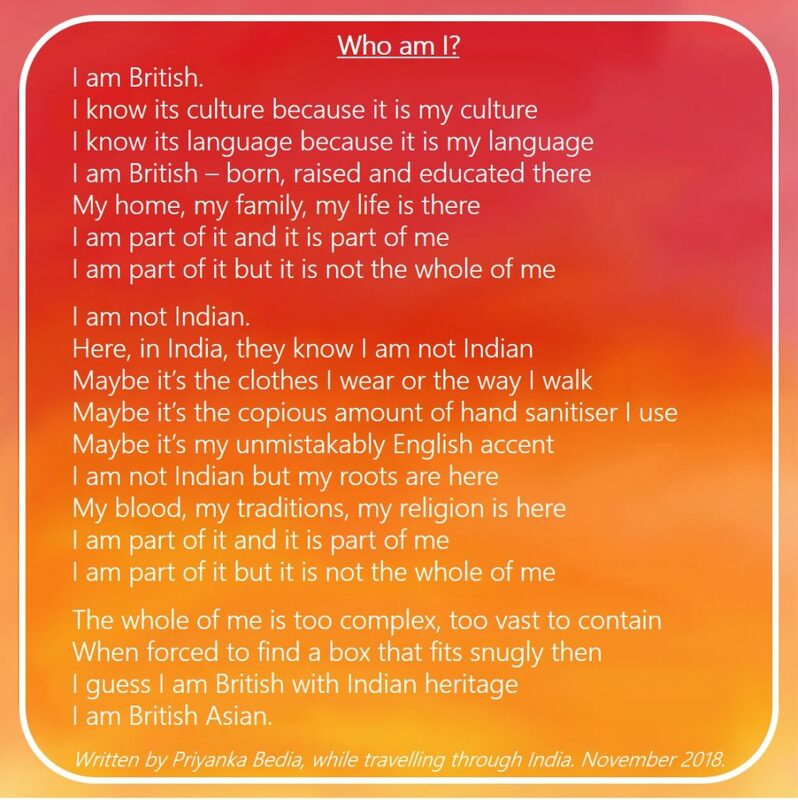 but there was a question on my mind that I’ve had for a while: Am I Indian? I wondered before I left the UK if I would feel ‘Indian’ when I went to India – I’ve never lived there, my parents have never lived there. It’s all the way back to my grandparents’ and great-grandparents’ generations who grew up in a small corner of Gujarat. But I thought that when I arrived, I might feel a sense of connection to the country. After writing this, I spent a couple of weeks in Gujarat to meet family and find out more about our history. I was incredibly lucky to be able to do this trip with my grandparents and also my Papa joined us for a week. I visited our family mandir, the house where my great grandfather was born, our ancestor’s shrine, our family farms…. The list is endless and I’ll write about them in more detail soon. When I went there, surrounded by my extended family, I had some sense of belonging – it was a magnetic pull to the place that I’m struggling to put into words. There was something about being there, that just felt right. It wasn’t my home – my home will always be the family house where I grew up in Essex; where we sit around the dinner table chatting for hours, where we celebrate birthdays and Diwali and Christmas, where I used to play with my sister and where I still play with her kids today. I am, and always will be, British. But through this journey, I have a new affinity and understanding of our family, its history and its eternal link to Indian soil. This is fascinating to read. 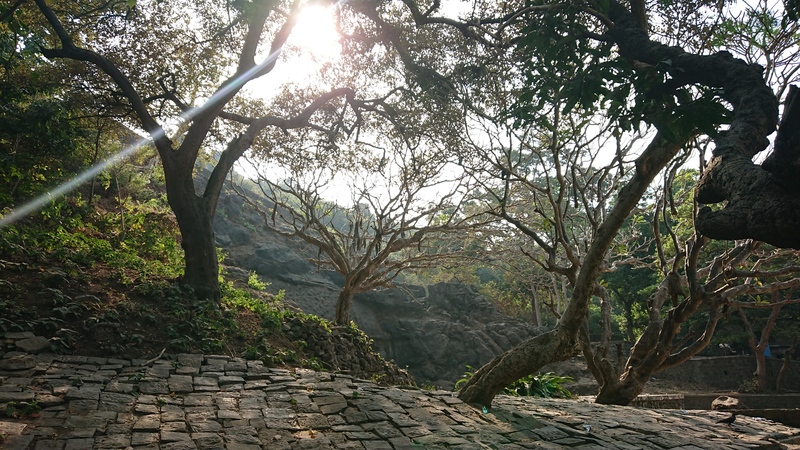 We lived in India for a year (left March 2018) and although it was an interesting year (lots of ups and downs), and I miss it a lot, Bangalore never felt like home. I can totally relate to this – it’s how I feel when I go back to Israel but it’s very interesting to reflect on…isn’t it? This is such a thought-provoking post. I loved the poem and really enjoyed hearing about your journey. What a beautiful post Priyanka! I absolutely agree with you. Home is where your family is. My family is of Mexican heritage but I was born and raised in the U.S. I’ve only been to Mexico twice….once when I was a little girl and when I met my hub’s grandparents. I didn’t pay attention to the stares when I was little but as an adult, I noticed the people looking at me as if I didn’t belong there because I couldn’t speak Spanish as well as they did. Thanks so much for sharing your story with us! It really doesn’t matter where you’re from, it’s how you embrace who you are.